26/4/2013 Thursday a.k.a one of the scariest day of my life. After a month of procrastination, finally decided to have my intruding toe nails removed surgically. Yes, surgically. You heard me. Before this, it was done by a Filipino pedicurist. My toe nails started to intrude my toes since last year, and so mum brought me to this woman whom was introduced by my aunt. One of the reason I go to her place is because of the price. It's cheap if compare to other pedicure saloon , only RM10 for both feet. Though she doesn't have high tech and very hygienic utensils and equipment, but she managed to fix my bro's nails and mine for at least few months. This is how she removes the intruding nails. 1. A special liquid is used to soaked my nails to make it softer so it can be removed easier. 2. Cut off all the dead skin and trim the other nails. 3. Use a special cutter to cut of and pull only the edge of the intruding nails along with a lil flesh. It was quite painful but I really feel satisfied with the result. The nails are also gradually stop growing into the flesh. 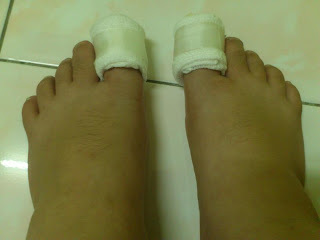 But until last month, my toes wouldn't heal itself as usual, but continued to swell and inflame. Usually the toes will get healed after a few days. It got worse and finally the flesh started bleeding and came out of the nail. Believe me, it's really disgusting. Back to my main story, waiting at the hospital was really both frustrating and nerve-wrecking. You just can't sit still but imagining what's going to happen to your nail. Afternoon, the nurse called me into room 13, the operation room. A medical assistant was in charge of the surgery instead of a doctor. He said that he's gonna removed the ENTIRE NAIL!!! I was completely flabbergasted that time, the procedure was different from my brother's. Another medical assistant that did my bro's nail a week before said he only needed to remove half of the nail along with the infected area. This medical assistant said the nail will grow back the same if remove only half of it. After a few confrontation by the medical assistant and nurses, finally I listen to them and decided to remove the whole thing. I lied on the bed scared, panicked, nervous, both palms sweating heavily. The nurse gave me a blanket to cover my half body, while they were making preparations, millions of thoughts ran through my mind, questions just won't stop popping. Will the surgery succeed? Will it be painful? Why do I have to go through all these panic-stricken process? Then I started blaming the Filipino pedicurist and thinking of all the worse case scenario that might happen. Then I started praying to calm myself down. Watching the nurses preparing all the surgical utensils like big tweezers pliers already making me nausea. Then the scene in front of me made me completely taken-aback. The M.A. was holding a lengthy injector preparing to pierce it into my already poor painful toes. hence I asked:" pernah buat operation macam ni kah"
"pernah, banyak kali sudah." The M.A. replied confidently. The pain of 4 injections of anesthesia was really intense. Only God knows how much pain I endured that time. The nurses and M.A. kept asking me "Sakit kah?". I replied "sikit". While they are conversing with me, a sudden short light pain could be felt. "Oh thank God" what a great sigh of relieve after hearing the word "sudah". And the agonizing process repeat for another toe while the nurses were chatting with me trying to calm me down. The nurses were calling me kakak. So I asked their age. Guess what. They are as old as me! They came here for practical. I didn't know how long it took, finally, the operation completed. Took pain-killers and antibiotics and went to Lintas Brooklyn to celebrate my 1st succeeded surgery. Starting from now on, I'm gonna go to the best pedicurist and get my toe nail fixed properly. Never in my life I will go through all these anymore!! !